Please refer to our stock # TG10057 when inquiring. This is a stunning Eisenberg set - unusualin the use of mostly baguettes, and in the dangling baguette earrings. I think it is from the 1940s - definitely from the era of class. The necklace is a choker 14" long with a 3" extender. That center design is 3" liong and 3/4" wide. 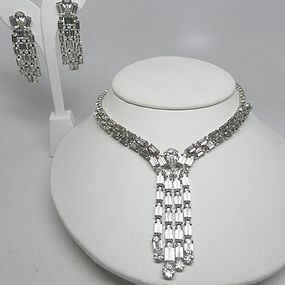 The earrings are clips and each one is over 21/4" long.Lke the centerpiece on the necklace the earrings" rows of rhinestones are not solidly connected, so that they can move and reflect the light even more spectacularly than otherwise. The pieces are all in good condition - rhodium backed, no dark or discolored rhinestones, and all three pieces are marked.